I suspect that only those who enjoy accounting can easily understand RCW 69.50.540, the statute that provides the details on marijuana excise tax appropriations and distributions. Here’s my attempt to provide a compressed, simplified version of the statute. For 2017 legislative budget information on the distribution of tax revenue to local governments, see Taxing Marijuana and Revenue Sharing. The state excise tax on retail sales of marijuana was significantly changed in 2015 by amendments made to RCW 69.50.535. There is now a 37% state excise tax on all retail sales made at state-licensed marijuana stores. That excise tax revenue is increasing in a very dramatic fashion. For example, according to the Liquor and Cannabis Board’s (LCB) October 17, 2016 “Weekly Marijuana Report,” retail sales of marijuana are in excess of $4,300,000 per day. Just a few months ago, retail sales were around $3,000,000 per day. 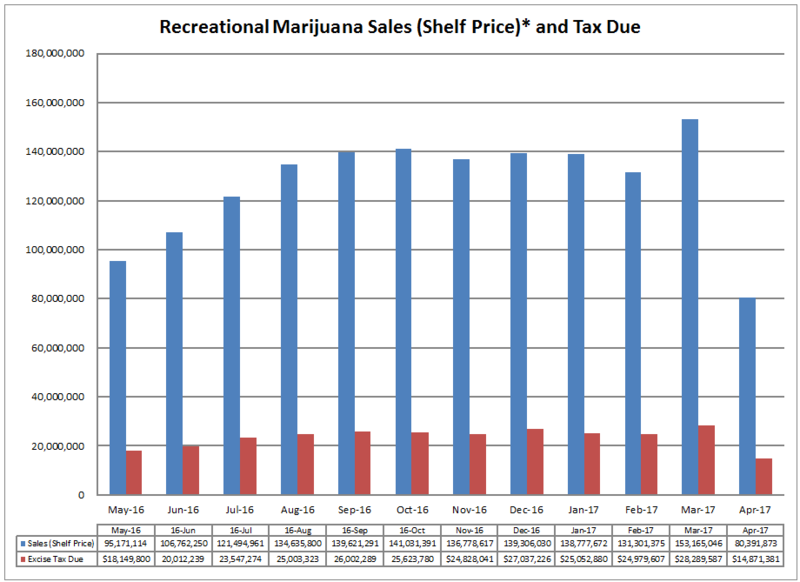 For the latest retail sales data, see the LCB Monthly Marijuana Dashboard. The drop in per gram prices at retail stores dramatically reduced illegal sales (hard data on that is hard to come by, but that’s what I’ve heard). If you do the math on the per day marijuana excise tax obligation, it comes to over $1,500,000 per day. That’s a big chunk of change for a state that will be struggling with significant revenue issues during the coming legislative session, including state funding of public education. The good news is that cities and counties share in the state marijuana excise tax revenue. The bad news is that even though the marijuana tax revenue is rising, RCW 69.50.540(2)(g)(iv) caps the amount shared by cities and counties at $15 million for fiscal years 2018 and 2019, and $20 million per fiscal year thereafter. Assuming—conservatively—that the per day marijuana excise tax obligation remains approximately $1,500,000 per day, that means that the state should be collecting nearly $550,000,000 in marijuana excise tax revenue per year by 2018, and that amount could be even more if retail sales continue to increase so dramatically. 70% to cities and counties on a per capita basis, with counties receiving 60% of this portion (funds can only be distributed to local governments that do not prohibit the siting of state-licensed marijuana producers, processors, or retailers). Counties, cities, and towns can use the MRSC State Shared Revenue Estimator to review the projected amount that each jurisdiction will be receiving from the local government share of marijuana excise tax revenue during the coming year. A minimum of $511,000 to the Superintendent of Public Instruction to fund grants to building bridges programs. Keep in mind that as the revenue grows, so do the needs of state and local governments. The marijuana excise tax is one of the few new taxes in recent years—and it is certainly a standout in regard to the rate of growth. There will be ongoing discussions at the Legislature regarding how the marijuana revenue is distributed, and your local government associations will be at the Legislature representing your interests. Have a question or comment about this information? Have another topic you’d like to see a blog post discuss? Let me know below or contact me directly at jdoherty@mrsc.org. What federal or state law says that cities may not tax the monthly fee paid by subscribers to satellite broadcast services?